Yoshi’s Crafted World doesn’t use its clever conceit as well as it should or weave a poignant story, but it’s still a solid and accessible Nintendo platformer. Is political crisis getting you down? Need a breather from the toughest FromSoftware title in years? Lucky for you, baby Bowser has stolen all of Yoshi’s dream gems, and he needs your help to get them back. Yoshi’s Crafted World is the spiritual successor to Yoshi’s Wooly World, a Wii U title known for its adorable aesthetic and paint by numbers Nintendo design. Not much has changed, to be frank, beyond the switch (no pun intended) to a papercraft world, where every piece of environment art appears to have been pulled from the bins behind a Tokyo konbini. From discarded milk cups to popsicle sticks, Yoshi’s world is full of charming garbage. Each level is a diorama of upcycled trash and experimental furnishings, the kind of thing you see on middle-class daytime TV. The variety in levels is heartwarming, from river rides on lily pads made of cork to plasticine spacewalks. There’s even a mission where Yoshi has to evade Sackboy serial killers, each fabric-y foe wielding a teensy tin foil axe. Watch our video review above. 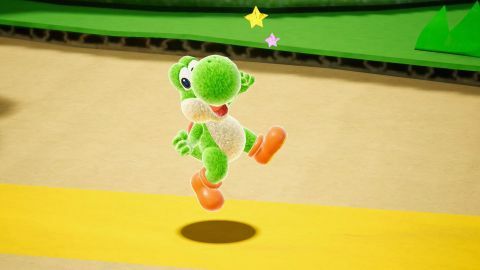 Despite the chaos of later levels, the serenity of Yoshi’s Crafted World is its unique selling point. The wistful score behind each level wraps you in a sonic blanket as you flutter through the sky, a marked departure from the chafing cardboard that lines each level. There’s a wonderful Shoji mission where you have to guide Yoshi’s shadow through screen doors, jostling past bamboo thicket made of plastic straws. The D.I.Y art direction is a clever illusion that I kept being tricked and subsequently delighted by when I figured out what made each asset tick. The imaginative theme of each level was always realised with trademark Nintendo charm. The trash becomes treasure, especially when it’s repurposed as costumes that Yoshi can wear like armour. First, you have to roll the dice with a gachapon machine, unlocking parts of a blind box set with the coins you earn in each level. It feels a little bit unnecessary, but it eventually broke me when I realised I could suit Yoshi up in a variety of trash bins, a potent visual metaphor. These range from simple garbage to more illustrious costumes, like an adorable water wheel that turns as Yoshi runs. If you’re the kind of person who grunts and rolls their eyes at something as insignificantly wholesome as this, this is clearly not your game. Despite its stellar looks, the crafted conceit isn’t woven into the world with quite as much care as Wooly World’s balls of yarn. There are moments of clarity when you’re using a rhino’s tin-foil horn to pop balloons, or climbing pop cans with magnets, but it doesn’t quite find a way to consistently tie the gameplay to the setting, making it more about curious exploration than solving clever puzzles. Games like Tearaway and LittleBigPlanet have already trodden on similar ground with greater effect, which diminishes some of the pizazz, especially when most of the levels follow the same platforming formula. It even attempts to work in the 3D lane-jumping from LittleBigPlanet, with Yoshi moving in all directions to find collectables. This creates a welcome sense of adventure, but the exploration is fairly limited by your three-button skillset. "The crafted conceit isn’t woven into the world with quite as much care as Wooly World’s balls of yarn"
Some of my favourite levels felt like mini-games. One had Yoshi channelling his inner Reptar as he entered a mech-suit and punched the crud out of buildings. Others toyed with flight and momentum mechanics and succeeded in piquing my interest after a world or two of the same old system. The main thing that bogs it down is the egg-throwing mechanic, which requires you to hold down a button and aim with the left stick at environment assets to surpass puzzles and pick up collectables. I’m perplexed as to why this doesn’t utilise the gyroscopic motion in the Joy-Cons, which would be far more intuitive, even if it was just an option. Having to micromanage the rest of Yoshi’s platforming abilities alongside this is deeply frustrating, especially when the screen scrolls faster than you can throw. The same can be said for HD Rumble, which is sorely under-utilised. Instead, there are seemingly pointless dialogue choices and pencil boxes that double as anti-air projectile launchers. See! Now you’re smiling again. It’s daft Nintendo fun, and it doesn’t take itself very seriously. Bowser Jr. and Kamek are the thick as pigs antagonists who berate each other in between worlds. Kamek rallies against his subordination by referring to his infallible partner as Your Stinkiness or Your Stumpiness, yet he consistently bends to his demands for increasingly ridiculous bosses. The aforementioned dream gems and Kamek’s abilities are used to summon papercraft opponents that could only be born from the mind of Bowser’s bratty offspring. These constitute some of the game’s most inventive levels, where a rogue's gallery from Mario lore appear, yet you can see every fold and crease on their balloon or papercraft surface. It would be foolish to spoil them here but be ready for a true test of what you’ve learned, and a grin from ear to ear. Topple them and you’ll collect the gems that fill out the Sundream Stone. That’s about as far as the surface-level story is willing to go. Playing Nintendo’s latest crop of spin-offs, I’m left begging for a human element, or some kind of emotional drive to push empathy into the story, Pixar-style. What if some plucky kid actually made these papercraft dioramas that Yoshi is exploring? The dream logic of these worlds succeed on the merit of their own design, but when you zoom out and think about the inconsequential narrative, there’s nothing there to make the cogs turn. Replayability-wise, you can play through the flip side of levels to find poochy pals, and there are tons of collectables and a few secret zones for the completionists to find, as well as the aforementioned costume sets that you can farm coins to unlock. It’s a shame they don’t really do anything beyond look cute though. If they had certain functions to make the platforming easier, that would incentivise the roulette machine model, rather than just being a cynical costume collector. Yoshi’s Crafted World can be difficult in the later levels, especially if you’re out to pick up everything. There’s a glowing indicator every time a Smiley Flower appears, the main currency that gates each world. Sometimes it can still be a challenge even with the visual aid, but Red Coins are more elusive, asking the player to haphazardly chuck eggs at everything in sight just in case. It’s very accessible for little ones too, or people less comfortable with platforming games. Mellow Mode affords Yoshi a pair of wings so he can endlessly wiggle through the sky, his shrill shriek stuck on replay. This can be activated at any time, so I’d often end up switching it on in a tight spot, especially if a collectable was out of reach. The difficulty in recommending this game is that it’s an absolutely solid Nintendo platformer, but it doesn’t really do anything ambitious or use its conceit to great effect. I consistently wanted to soldier on to see what the next gorgeous world would entail, but when all was said and done, the experience felt slightly hollow, even if I’d had my eyes bleached by Yoshi’s cute capers.